Star Tissue is one of the UK’s leading independent manufacturers of hygiene paper products. 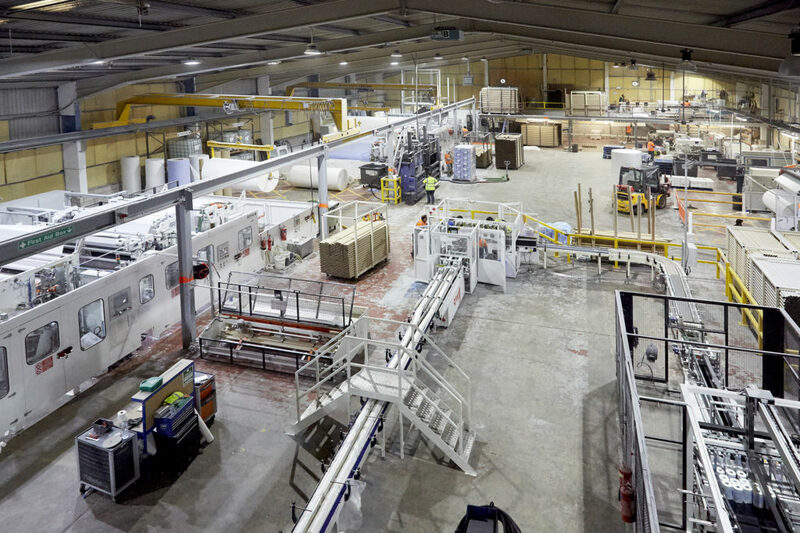 Star Tissue manufactures a wide range of household and away-from-home paper products from its custom built production facility in Lancashire. Star Tissue UK manufactures high quality hygiene paper products that can be customised to fit into most dispensers or used as stand alone rolls. We offer both pure and recycled tissue ensuring all our tissue is of a very high standard and is sourced from tissue manufacturers who are registered with Forest Stewardship Council (FSC). Our recent investments in new manufacturing technology enables us to emboss each ply separately and then laminate the plies together creating a stronger sheet with greater absorption capacity. We use the latest production methods producing a high quality finish to the end of the rolls. Major investments in production facilities in the UK have enabled us to offer a wide range of very competitively priced quality products efficiently with short lead times and the flexibility to match the products to the needs of individual clients and sectors. Star Tissue strives to provide the highest level of customer service and is strongly committed to our continuous improvement programme constantly ensuring we are up to date with client requirements and market standards. All our AFH products in the Sirius, ecoroll and Evotex range meet the CHSA Soft Tissue Standard ensuring the products meet the specifications on the label. Star Tissue is also accredited with ISO 9001, 14001 and OHSAS 18001. Having these three standards has set us apart from our competitors and enables us to manufacture consistently high quality products. The OHSAS 18001 accreditation has also helped create a safe and healthy working environment for all our staff. The ISO 14001 accreditation confirms our commitment to minimize environmental impact in our day-to-day operations.